One of the most frequently requested features for a security camera system in general, is the ability to receive text message alerts when motion is detected. However, this is not really what people want from their camera system. Many systems claim to have this ability, but in reality it does not work properly. This is because security camera systems rely on video motion to trigger an alert or event. This means that anything that moves on the screen will send a text message, leading to extremely high level of false alerts. 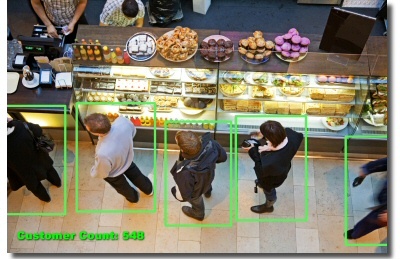 You see, the motion detection capabilities of security camera systems are designed to record everything that happens with motion detection, to deaden the sensitivity of the motion detection to the point where there is no excess recording and no false alerts, would also mean that the system will not be recording some events that it should. This is why alerts based on video motion, get shut off within minutes due to false alerts. What people really want for their camera system, is to receive an alert when a person approaches their building, or a vehicle approaches the building. Our new SMART cameras deliver just this capability! Each of our new SMART IP cameras integrate with our AVM (Advanced Video Management) system to deliver alerts only when the event you specify occurs. These cameras perform calculations based on the size, shape and speed of an object to classify it on the screen, then waits until the object enters into your pre-defined zone. Events can be based on objects entering, leaving, crossing a specific line, entering into a zone, or even waiting in a certain zone (dwelling) for a specified amount of time. Once the event is triggered, it is passed to the AVM system, which can deliver a variety of alerts, such as popping a camera up to full screen, sending an email with picture, sending a text message, setting a bookmark in the archive and more. With this new level of video analytics, your camera system can deliver what you truly want out of security cameras, but did not think was possible: Your camera system autonomously lets you know when important events are occurring so that you only need to watch when it tells you. 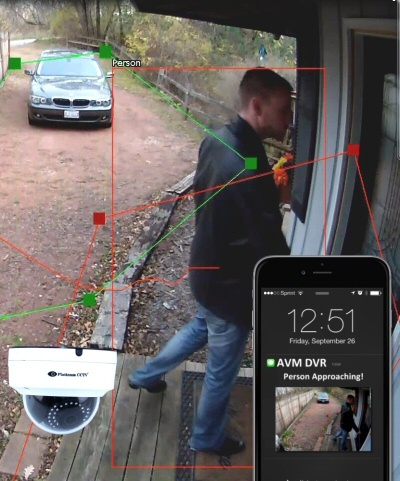 This is truly the evolution of home and business security camera systems.